Surprise! I am now in to Bali, Indonesia kick-starting a six-month jaunt across all southeast Asia. This gigantic trip is something I have been dreaming of for most of my life and planning for the past three years. I have the next six months planned out to the day. This was not my intention in the beginning. I was hoping to arrive with only a one-way ticket and a hotel reservation for the first few nights, then wing it from there. I thought I would leave everything to chance and serendipity. I imagined staying longer in the places I loved, fleeing the places I didn’t love, and following random people I met on the road to places I didn’t even know of. But that’s not how it’s going to be. I need a certain level of comfort and convenience that $10/night hostels cannot provide. I need to know where I am staying and how and when I will make my next move. I don’t want to be planning a trip while I am on a trip. I don’t want to stay in a cruddy place because all the best guesthouses were booked. 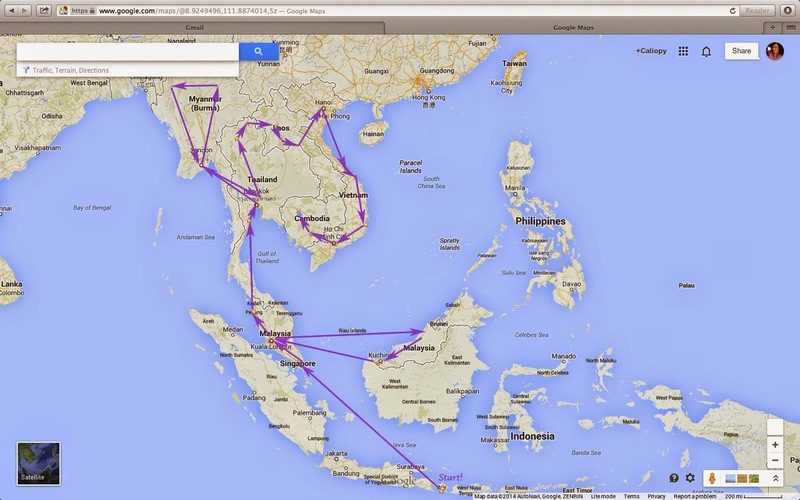 Back in the 80s, my partner’s friend backpacked all around Southeast Asia. He had no plans and went with the flow, wandering from town to town, sometimes finding a nice guesthouse, sometimes sleeping outside in a sleeping bag. But that was before the internet, when his only other option would have been to book an expensive tour and be herded around like cattle. With the internet, we can essentially be our own tour operators, customizing our itinerary, accommodation, and transportation. There is no need to wing it when all the savvy people are planning ahead. That being said, I have no idea what kinds of events and activities will shape my daily life. I have the experience of living in my home country, and living in a foreign country, but I don’t know anything about life on the road. My longest trips were in Japan, on a rail pass, where I hopped from city to city and stayed in chain hostels, and Pakistan/Dubai, where I stayed with local families and was well-taken care of. I have never done such a long trip involving so many countries, knowing so few people in each place, and have so few expectations. In every city we will be staying at least three days, except for a few transit towns where we will only be staying one night. In bigger cities we will be staying at least six days, to see and experience more. Our longest stay will be in Chiang Mai, almost one month. The second longest will be Saigon, for two weeks. We tried to avoid flying as much as possible but sometimes it is the only option. We will be taking ten flights on six airlines. We will not be taking more than one major mode of transportation per day. For example, if we have to take an eight-hour bus ride to the town where we will catch a flight out of the country, we will spend one night in the town to avoid missing our flight in case the bus is delayed. We will be spending at least six nights on trains in at least five countries. Our first choice was to have an apartment in each city, so that we could gather some experience as residents, not tourists. In many places it was possible to book apartment –style lodging though airbnb. Where it was not possible, we booked homestays with local residents and families. When that was not possible, we booked mid-range hotels. We are bringing carry-on luggage only. Each of us has an Osprey Farpoint 55, which includes one 40 L bag and one small 10 L bag. In my big trips to both Japan and Pakistan, I brought two gigantic suitcases which were checked on the flights there and back. This is the first time in my life when I will be forced to travel light. My partner and I are both sight-skippers. We are more about "being" than "seeing." Although there are some cliché things no one should miss in certain destinations, we are going to avoid obvious tourist traps, cheesy museums, guided tours, and malls. Both of us will be working part time while we travel, so we need to spend about four hours per day for five days in a week, working online. I will also be spending extensive time writing for my novel and working on launching a new website in Japanese, as well as blogging (we’ll see about that). So we will be café hounds. We are both active people and hope to maintain our routine of exercising outdoors at least once a day. I would like to run 6-8 km per day. I have done somewhat satisfactory research on each country, but t is no where near thorough. I looked up some basic and made general lists of things to see and do. We plan to balance out the “to-do” list with free time. In each city we will spend the first day walking around and surveying the scene. This will give us a general feel for the place, the layout, people, ease of access. I'm still unsure as to the direction this blog will take once I am on the road. Until now it has been a collection of memories and musings from short vacations and one-year of living abroad. Moving forward I am not sure if I want to turn this into a travel diary where I record daily or weekly stories from the road, or continue with unrelated asynchronous posts about the fascinations of life in another country. I imagine this blog will evolve organically, driven by my experience and inspired by my surroundings.